Mix the yogurt and honey until thoroughly combined. Line a baking sheet with aluminum foil, and spread the yogurt mix out onto the foil using a spatula. 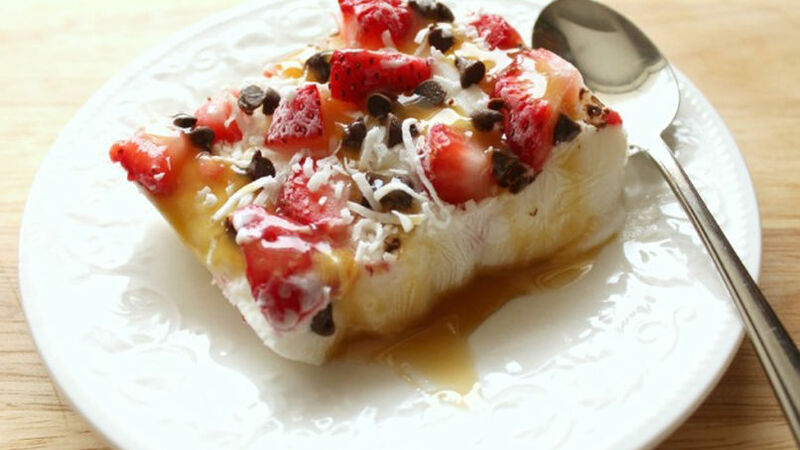 Add the chopped strawberries, chocolate chips and shredded coconut. Set the baking sheet in the freezer for 1 hour or until the yogurt is completely frozen. Once the yogurt is frozen, remove from the freezer and use a sharp knife to break the sheet of yogurt into pieces. To make the presentation of this snack extra special, garnish with caramel sauce before serving. If you’re looking for a cool, sweet treat to enjoy on hot summer afternoons, this is the perfect dessert for your next get-together. It’s delicious, refreshing and the presentation is simply beautiful. Plus, it’s easy to prepare and calls for few ingredients. Try this frozen yogurt and strawberry bites recipe; your little ones will love it!